Trinity Estates is an investment management and professional services company specialising in real estate. Every year, a comprehensive guide to upcoming developments is produced for investors. 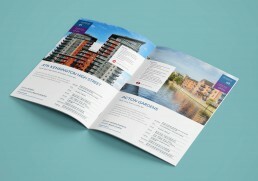 Alongside a print report, I developed a single page microsite to host the downloadable document. The demo website currently shown is a redacted version of the final site for confidentiality. This project involved managing several different types of information, working with detailed charts and tables as well as liaising with various departments responsible for each section. 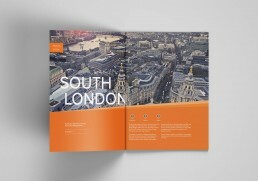 Trinity we’re looking to create a mini brand identity for their flagship annual report. 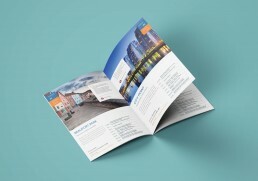 Keeping in line with their existing brand was a must, ensuring the new report complimented other collateral, as well as providing a fresh outlook for the new research and insight. 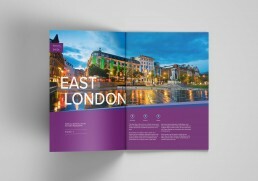 Producing clear colour coordinated branding really helped bring this piece to life. Due to the range of information included in this report, it was important to ensure the reader was navigated through the document. Easy to identify markers and icons were used to bring familiarity to similar types of information and the use of bold, striking imagery helped create impact.